Make sure you stay in the loop with all GEC Venturing news! Click here to be added to the communications email list. What is the GEC VOA? 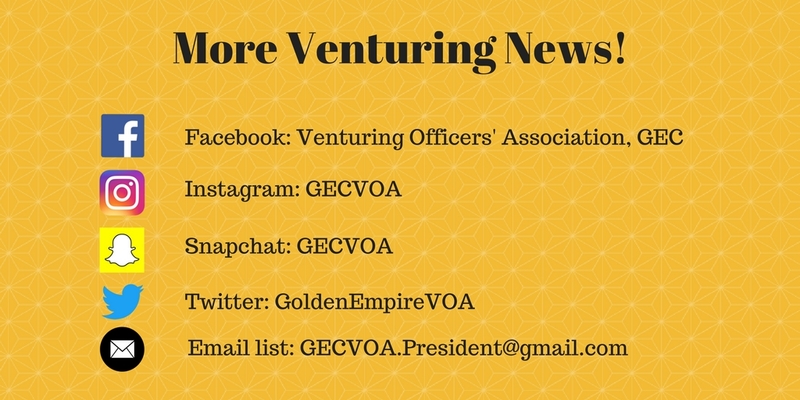 The GEC VOA is a group of elected officers working together to provide support and guidance to sustain and grow the Venturing program in the Golden Empire Council. The VOA hosts several events per year to bring Venturers together from across the Council in its mission to sustain and grow the Venturing program. It provides numerous growth opportunities for its officers and constituents using the “A-L-P-S” model of adventure, leadership, personal growth, and service. Join us for a VOA meeting! The GEC-VOA meets on the last Thursday of each month at 7pm at the Golden Empire Council Office. Did you know? - All Crew Presidents are voting members of the VOA! All Crew Presidents or their designee are encouraged to attend monthly VOA meetings and give a crew update, vote, make suggestions, and ask questions! Questions? Contact Nate Osborn, GEC VOA President. Apply for a Position in the VOA! Are you a dedicated and motivated Venturer ready to serve the Golden Empire Council while having fun and gaining leadership experience? Apply today for the 2018-2019 term by clicking here. Applications are due by May 15, 2018 and there will be a short interview required (date TBA). The VOA term runs from June 1,2018 to May 31, 2019. For more information about the VOA positions, duties, responsibilities, and expectations, please read the VOA Administration Guide and visit the National Venturing website. Interested candidates must complete application, be available for an in person interview, and commit to attending all monthly VOA meetings in order to be considered for a position. *The position of Vice President of Communications is currently vacant for the 2018-2019 term. If you are interested in applying, please contact Nate Osborn, GEC VOA President.